I remember watching in horror, the nightly news on television, and seeing the carnage and devastation it left in the wake of the daily slaughter in Rwanda in 1994. I was living in Africa at the time and it's haunted me ever since. I'll never forget seeing the absolute terror on people's faces, young and old, and the visible and paralysing fear. I always felt a kinship with the rest of Africa and heard many stories of Tanzania, where my Dad spent time as a young man, and learned to speak Swahili. The bonds of the African family (and villages) are so strong and thus, the closeness all around, I found enviable. What I could not fathom was how unbelievably vicious people could become, especially towards the weaker or lowly people. Immaculée's personal holocaust story is one of many who miraculously managed to survive. Africa has many, many tribes, and as a young girl, in a very stable and loving family, Immaculée never knew to which tribe she belonged. Her parents, believing all people were equal, hadn't told their children. The country was gearing up for "ethnic balancing", even though the Hutus hopelessly outnumbered the Tutsis. This was brought home to her when she was denied a scholarship to go to high school, even though she was second in her class and a good scholar. The alternative, no education, was less appealing. Her home was one of belief and prayer and in time, both were challenged. 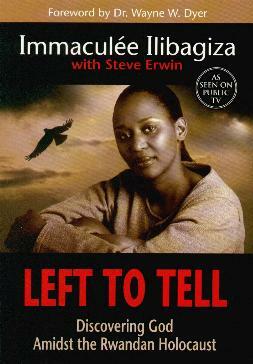 This compelling and chilling story of how this young woman survived, will have you on the edge of your seat. 91 days in a tiny bathroon with seven other women. I can't even begin to imagine how they survived. Although her faith wavered ever so, it remained in tact and she gained the power of forgiveness of those who brutally wiped out her family. How, I'll never know, but I salute her from the bottom of my heart. I'll never fully understand how this brave young woman managed to keep it together. God is confusing, but her faith was so strong, so pure, and her story is the result. Que Dieu vous bénisse. Salaam sana Mungu akuweke sasa na kawaida. Conclusion - Powerful, harrowing, and very moving. Makes us look at our own lives and to truly be hankful for what we have. This book will bring you to tears, many times. Everyone should read this book.